2013 will see a new resource for web designers. ByPeople is going to bring you a market packed with icons, templates, PSDs, logos and lots more. 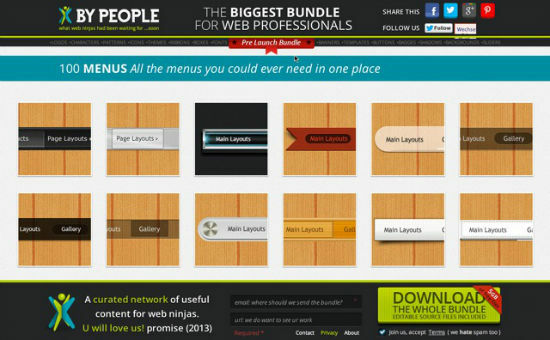 ByPeople promises to deliver everything web-ninjas could ever need. To shorten the wait its creators decided to put up a large archive for free. The archive, containing hundreds of design elements, comes at a weight of around 700 MB to a desktop near you. All you need to do is get your hands at an app that’s able to unpack a 7z-archive and tell ByPeople your mail address. If you are a designer chances are that you`ve run into the Shock family already. You most likely know WebDesignShock, IconShock and others. It is this family that brings up another member. At the time of this writing not much can de said about what ByPeople is going to offer. Basically all you find by now is this really large download bundle. If you ask me whether ByPeople is going to provide a commercial offering, I have to admit, that I cannot tell you. I’d assume they do though, as all the other members of Shock offer paid content too. Take it while it lasts and download their large package right now. Regarding the topics any designer will find at least something in the pack. There are complete website templates as well as masses of single elements. Hundreds of icons, buttons, sliders, menus, backgrounds, toolbars and lots more can be found. Even logos and business card templates are part of the deal. The quality varies widely. If you ask me personally, I’ll tell you that I appreciate most of the bundle. In general I like the saying to not look gift horses in the mouth. And this gift horse is no small pony. To download the bundle you have to tell ByPeople your mail address. The service promises to send a confirmation mail in between ten minutes after your submission, so any disposable mail address will do. I received the confirmation immediately. As I have subscribed to other services provided by Shock, I can assure you that they really do stick to their promise not to spam you besides letting you know about new freebies once in a while. What leaves me puzzled is the reason for establishing another platform that basically delivers the same things other members of the Shock family already deliver. At this point let’s stay curious. In 2013 we will get this question answered. Wow this is just.. wow. This is an absolutely amazing offering! Will defiantly be downloading, and sharing. It says “5GB” of free files, but I’m downloading it and it’s only 684MB, am I missing something? Yes, when it decompresses it will be close to 5GBs.